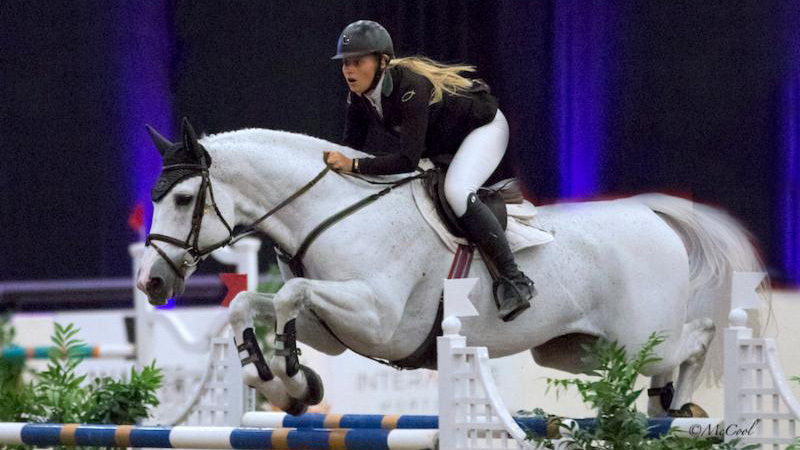 All the 53 riders in the $50,000 1.50-meter FEI Las Vegas National Welcome Jumper Speed Classic had their speed demon faces on since the class served as the qualifier for the $100,000 Longines FEI Las Vegas World Cup qualifier on Nov. 18. And galloping in the arena as the 12th in the order, U.S. rider Kristen Vanderveen rode a masterfully fast track in 54.77 seconds aboard the 12-year-old Belgian Warmblood stallion Bull Run’s Faustino De Tili. It was a performance that would end up holding the lead for the remaining 41 rides and giving Vanderveen the win. Rails and refusals plagued a number of competitors, with the final jump on course, a red plank vertical, often causing a heartbreaking 4 faults. But Vanderveen put full trust in her partner of three years, knowing that speed classes are one of his strengths. “Having this qualifying class in a speed format definitely worked to my advantage, since we focused on speed classes in Wellington this year,” she said. “The secret is to keep him happy. When he’s having fun, he’s super careful—especially in the speed rounds and jump-offs,” Vanderveen continued. Want to get to know Bull Run’s Faustino De Tili better? Go Behind The Stall Door with him. See full results for the $50,000 Las Vegas National Welcome Speed Classic.